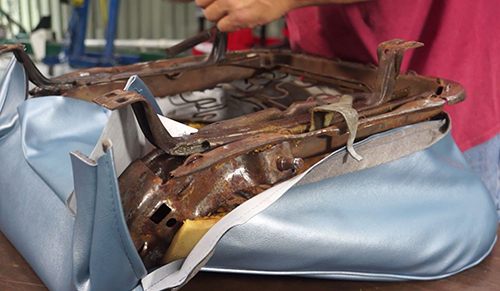 As Rick Drewry, Sr Claims Specialist at American Modern, prepares to install the new covers onto the ’65 Chevy Malibu restomod, there’s only a few things that they are required to do before installation. First, they will take a premade rod, and slide it directly into place. Then, the back part of the seat is a little easier. The back part fits over the back bracket, where it should be, then you’ll locate the rod, and tuck it in between the cushion. Then you’ll take a set of hog ring pliers, clamp around the hog ring, and squeeze. 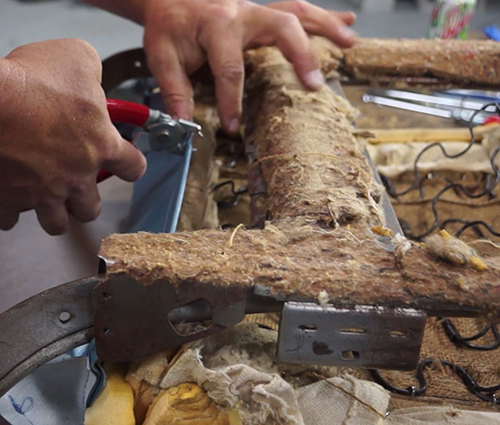 Make sure that the clamp is securely fastened by tugging on the cloth. The next step is to pull the cloth out and over the foam. 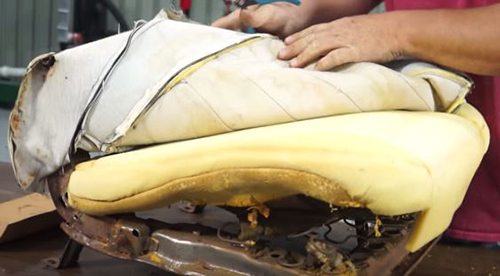 This process will be a tedious process, so make sure you are thorough before turning it over to clamp underneath. 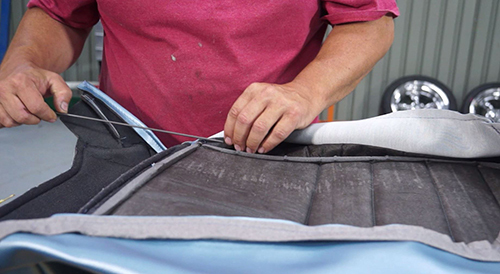 After stretching the fabric over the pivots for the upper part of the seat, you’ll need to make sure the top is fastened first. Then, pull it over, mark where the pivots are for future cutting. After this, stretch the seat cover over the frame. 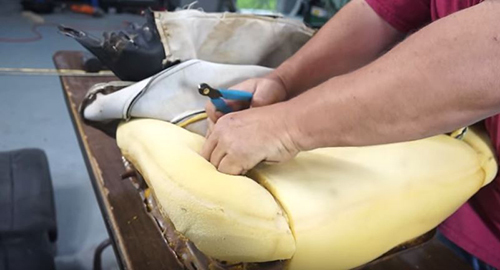 When doing the other half of the seat cover, turn it inside out in order to install the hog rings into the seam to give it that fit. If you do not do this, it lays out over the foam giving you an unnecessary air pocket. Another tip to have a nice form-fitting seat, is to leave it out in the sun or warm them up, they will become a little bit easier to maneuver. Make sure to clamp the hog ring to the bar that is outside the material to fasten it, then onto the frame of the seat. Now that the bottom half is fastened, you can focus on aligning the top half. When you hog ring it into the edge of the seat, the rod will make it nice and tucked in. After installing the hog rings to the sides to seal the cover, the side trim is installed. Locate the mounting holes with the screws, then screw it to the seat. 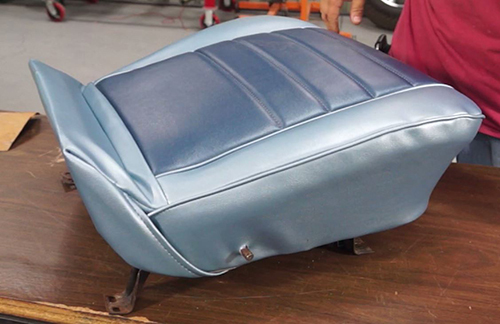 Attach the top part of the seat to the bottom, and finally it’s ready to be put back in the car. Influence your kids and the younger generation! 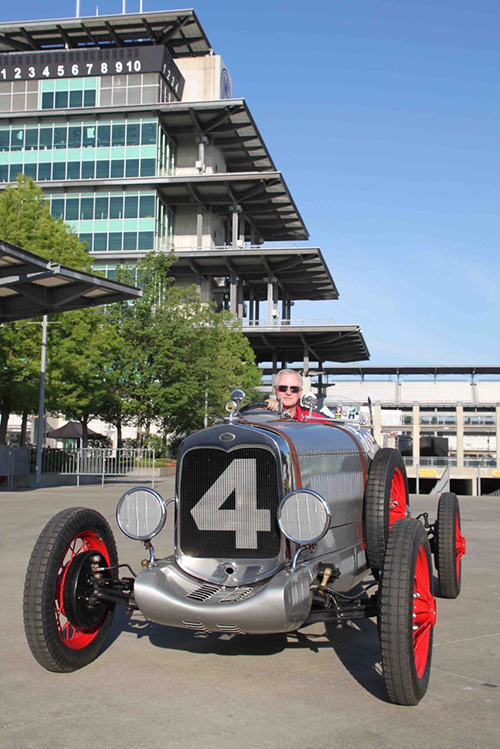 It is ok to share your passion about the cars you love and your personal history with those cars. Those stories will be remembered. Without the stories, it is hard for the kids nowadays to see why we are so passionate about cars. 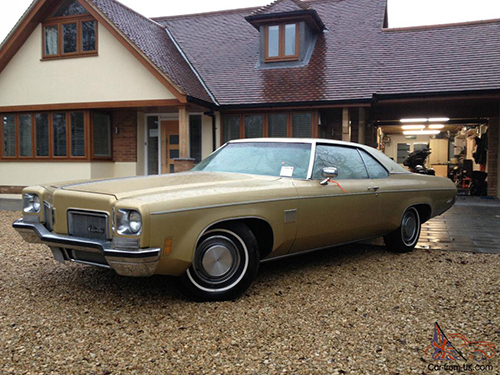 For example, when I was a kid, my mom drove a 1973 Oldsmobile Delta 88. It was a green 2-door, with a white vinyl top. It was a huge car. My mom being 4’11” tall only added to the size of the car. This car was awesome. It had a Rocket 350 engine with a 4-barrel, quadra-jet carburetor. With a full size bench seat in the front, I use to sit in the middle and shift gears from 1st to 2nd and then into drive whenever we went anywhere. If we were ever next to a car at a light that I thought we should hole shot when the light turned green, I also could talk my mom into flooring it on occasion. These memories will be with me forever. To this day, when I see a ‘73 Oldsmobile Delta 88, I immediately go back to that time in my life and think about my mom, who is no longer with us. I absolutely love those cars. So much so that I will probably own one eventually. Your kids should know about these memories, and you should be creating new “car” memories for them. 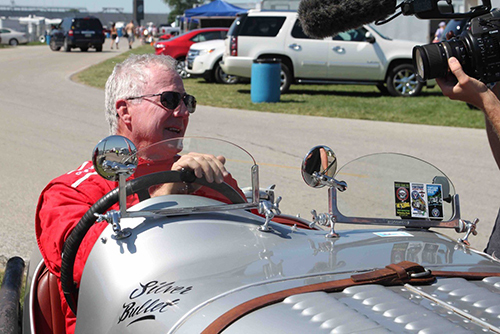 Get out and enjoy your old cars, and bring the family into the mix. They don’t know it now, but they will have those memories for the rest of their lives! 1955 was a pivotal and important year for Chevrolet. Not only did their passenger car lineup receive fresh styling that the public embraced immediately, their trucks received similar treatment as well. Series One trucks were actually introduced in the fall of 1954 and the new-look trucks set the pace for a great year for Chevrolet. Attitudes about trucks were changing fast in the 1950s. 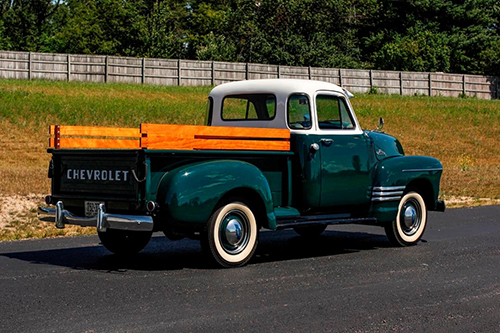 Lots of people used them for double-duty – while it was tough enough to be a work truck during the day, the new Chevrolet was also stylish and comfortable enough for everyday personal transportation. Known as the Task Force Series, the 3100s proved that there was a market for slick pickups. Chevrolet was one of the first makers to take advantage of that demand. The 1955 Series 3100‘s design was revolutionary from the cab forward. Truck buyers jumped at the chance to own one. 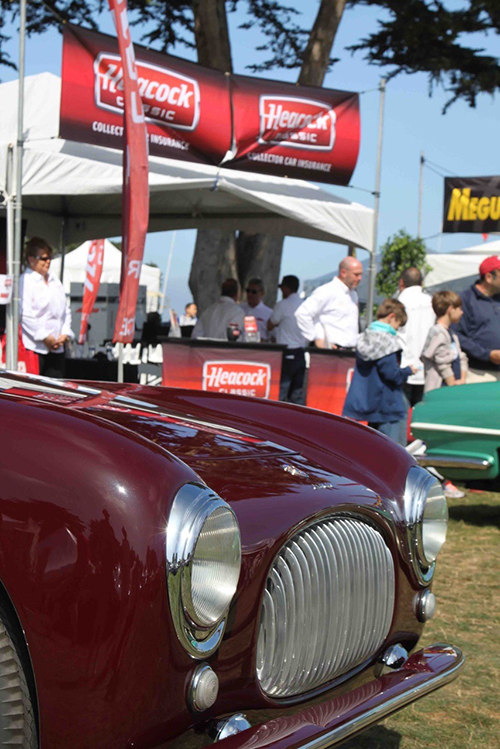 Inspired by passenger car design, it had a streamlined, wrap-around, one-piece windshield. It featured full corner windows and a larger rear window. The new trucks featured a lower hood and a chrome grille that emulated passenger cars. Jutting forward from the sculptured fenders and door surfaces, car-inspired headlamps with chrome rings helped to create an all-new, racy profile. The doors were wider and taller for easy entry. A new fresh-air heater / defroster system pulled air through the cabin and out vents at the rear of the cab. The dash design was beautiful and thoroughly modern, as was the sleek, car-like steering wheel. In 2008, this fine example was restored in original two-tone green and white livery. It shows excellent panel fit and a lovely shine. It is decked out with the accessory chrome package, wide whitewalls, chrome wheel covers, a factory windshield visor, side-mounted spare and a correct, new oak bed with matching oak side rails. 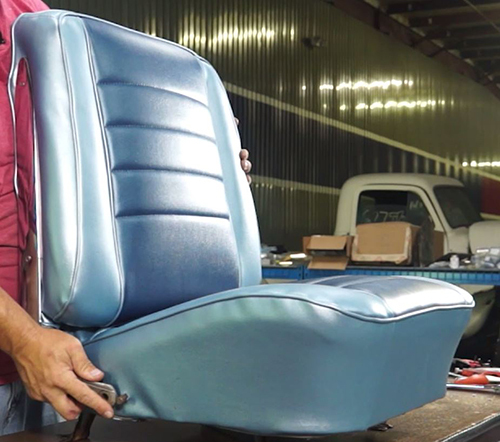 The entire interior appears original, from the factory AM radio and original vinyl upholstery, right down to the original rubber floor covering. 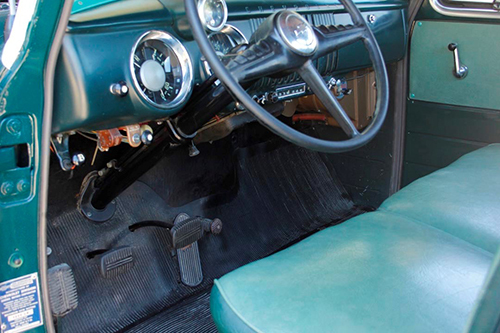 Even the original pedals are only lightly worn, indicating the fine and highly original nature of the truck. This and other 5-window cabs are highly desirable for their advanced styling with flawless visibility on all four corners. 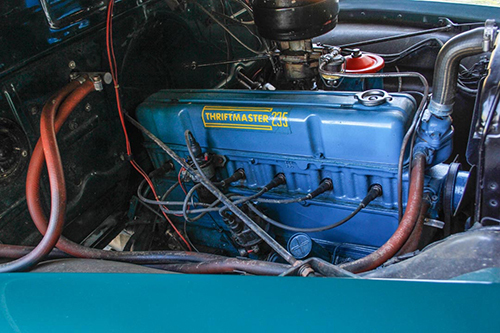 Under the hood, the original inline six engine is clean and quiet, with a tidy engine bay and correct appearance. The truck starts easily, idles quietly, and pulls with surprising torque. The original 3-speed column shifter makes this truck very easy to drive. Modern Chevy vehicles like the SSR and HHR both lean heavily on these redesigned 3100 trucks for their inspiration and it’s no wonder — ’50s-era pickup trucks have always had a loyal following. But they are often the subject of performance and cosmetic modifications, so today it can be difficult to find quality pickups of the era that are restored to their correct configuration. Since only 5,220 were reportedly produced in the 1955 model year, this beautifully restored 5-window would make a fine addition to any Chevrolet collection.